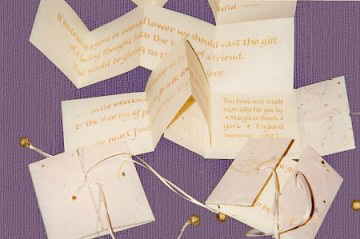 The cover of my book is cream mountboard covered with a sheer paper containing threads and some plant material. It is closed with fine cream ribbons finished with very small tinkly bells in an antique gold colour to coordinate with the lettering. The pages of the book are produced by cutting and folding one sheet of cream textured paper to produce a zig-zag book which folds both vertically and horizontally. My quotations are all on the theme of friendship. Book 3-1/8" x 3-1/8" (8cm x 8cm).